About a decade ago, I attended one of the Independent Grand Tournaments and faced off against a chaos army that included a converted Forgeworld Gigantic Chaos Spawn. That was the first time I had thought about actually converting one of those models. I thought the model was cool, but the Tyranid Scything Claws were a put-off as they seemed out of place. But replacing those with wings solves that problem. So all-in-all, it is a pretty simple conversion. But it's one that makes a huge difference. Additionally, I built up the base with several broken columns from Scrbor and several clay bricks to simulate Ha-kell standing amidst a long broken and forgotten civilization. When it came to painting, he was mostly painted with an airbrush. I began by painting the flesh areas with dwarf flesh and highlighting it by mixing in elf flesh. I then masked off the flesh areas as well as a little further up the body. 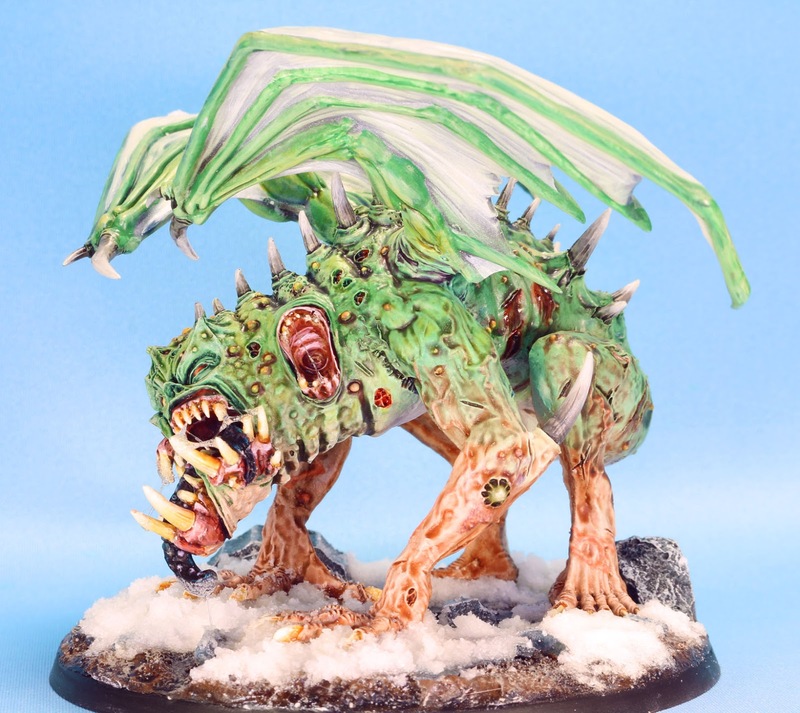 The green areas were then airbrushed with Vallejo Sick Green and highlighted by mixing in Vallejo Dead Flesh. The wing membranes were airbrushed with Dead Flesh and then highlighted by mixing in white. Finally, I removed all the masking and painted the transition locations with a mix of sick green and dwarf flesh, with a few highlights created by mixing in Dead flesh. After that, I pretty much applied all the washes to him, but not over the entire model. 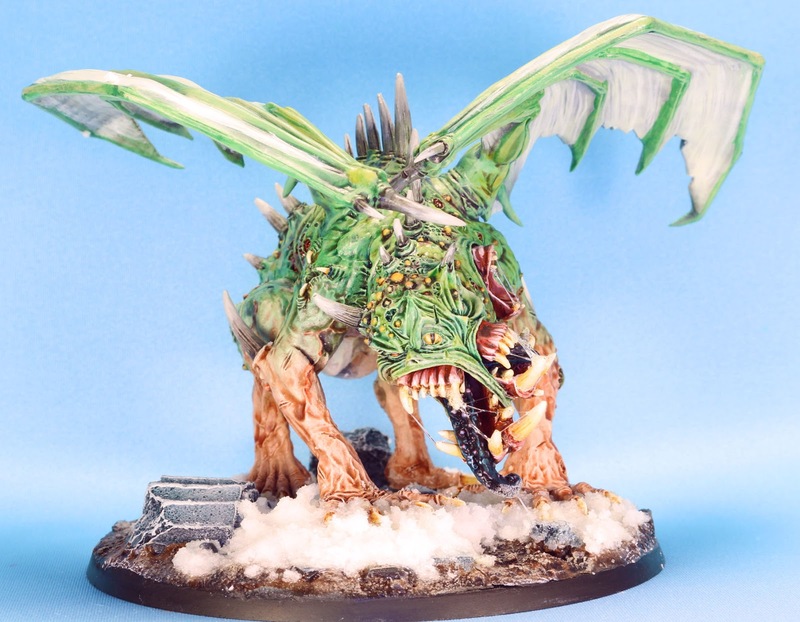 I made sure to apply them in splotches to give differing tones of the same color to simulate the change and freakish nature of a chaos spawn. After the washes, I applied some very thin layers of pure Dead flesh for the final highlights. The rest of the bits were painted pretty much as you can see, teeth, horns, gums, tongues, etc. Nothing interesting there. Finally, I added some saliva with Uhu glue. 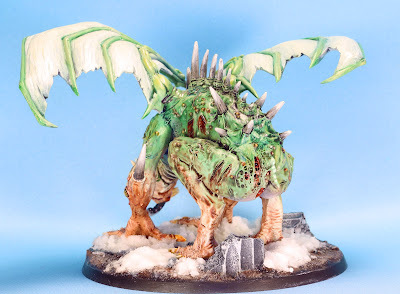 The gigantic spawn was the final piece in finishing my 2017 Armies on Parade entry, and I'm glad to have him done, but he was a lot of fun to paint. 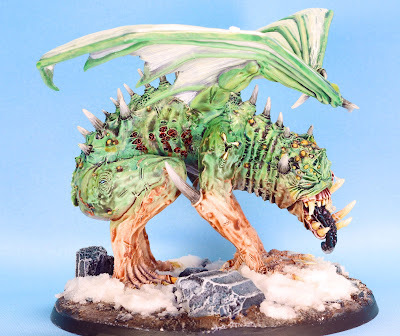 I've also entered him into Ex Profundis' Monster Competition, but after seeing some of the amazing entries for that, I'm so far out of my league! Bloody heck that's both impressive and disgusting. I like it very much. The black tongue stands out so well. Oh, man, that's awesome! I love hose colours and how you managed to make the transitions look so natural. Really cool! Thanks! I could only do that an airbrush! It's a cool model. Nicely done. Absolutely off the hook! I love the basic two tone colour scheme. So vivid and creepy. You've out-done yourself, Andrew. Thanks, he was originally planned as having three times, but I agree, the two tone one looks great and better than the other one would have looked.